Prostate cancer is the most common type of cancer affecting men. In 2014, there were almost 47,000 cases of the disease resulting in 11,287 deaths in the UK alone. Medical scientists work relentlessly to understand it better and find more effective treatment options and preventive measures. As a result, new findings on the disease appear every year. One of the recent studies has brought rather sad news for tall men. British researchers from Oxford University have found out that taller men seem to be at greater risk of aggressive prostate cancer that turns out lethal in many cases. This massive study involved more than 141,000 men that were monitored for about 14 years. 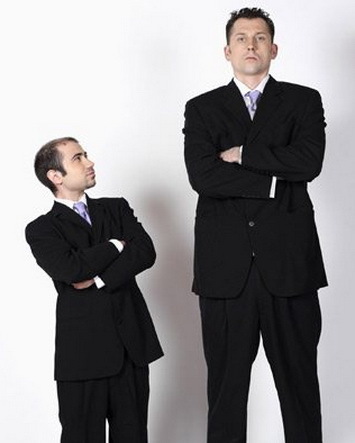 After analyzing the acquired data, the researchers came to the conclusion that every 10cm in a man’s height add 21 percent to his chances of contracting the aggressive form of prostate cancer. Interestingly though, the study results showed that shorter men have a reduced risk of contracting only ‘high-grade’, aggressive prostate cancer, but not prostate cancer in general. The researchers also found that obesity contributes to the disease, but that’s a factor oncologists have been familiar with for a decade or so. In fact, a high BMI has been associated with lots of possible health complications including other types of cancer as well. Currently, however, instead of BMI, doctors tend to use waist circumference measurement as a more accurate indication of healthy/unhealthy body mass. Although overweight men have statistically greater chances of dying from prostate cancer, the study didn’t detect any direct link between excessive weight and contracting the aggressive form of the disease. The researchers believe that such statistics against heavy man are rather due to the fact that it is more difficult to detect prostate cancer at an early stage in obese individuals. As a result, for many man with much excessive weight, the disease is diagnosed when it’s already progressed, which increases cancer patients’ mortality rate. This study, published in BMC Medicine, is in fact the first to link prostate cancer with a genetic, physical characteristic (the height of a man). Dr Aurora Pérez-Cornago, the lead researcher of the study, said the new results can help reach an insight into the mechanism of prostate cancer and factors of its development. The researchers also stress the importance of maintaining a healthy weight - the factor that can reduce the risk of developing the disease and, if contracted, help detect it at early stages.